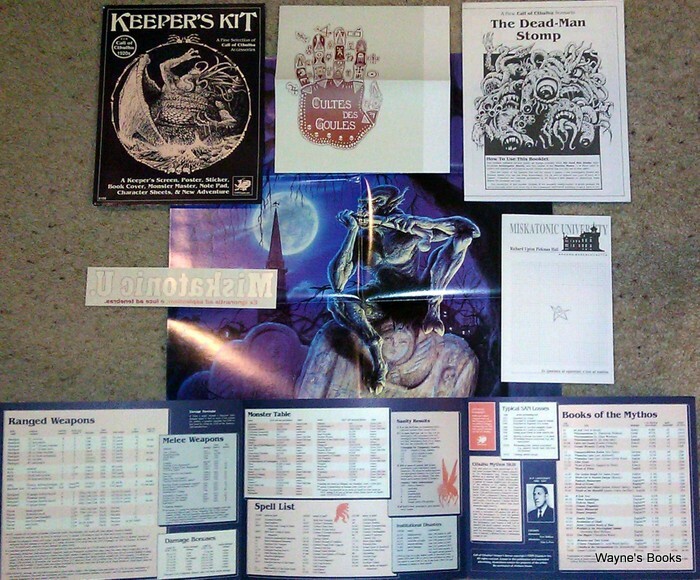 The CoC 1st edition set was the 2"-deep box typical of Chaosium box sets of the time. A later (2nd?) printing went to the 1" depth box, and kept the 2009-X product code. Its rulebook has errata on the back cover, dated October 1982. I have seen a flyer in one of these later print shallow-format 1st edition sets with the Asylum and Other Tales as "Coming Soon" and "Do not order before June 15, 1983". Another, similar set had a Winter 1982 Chaosium games catalog. So, that should give an indication of the changeover. Contents: 'What's in this box' contents sheet(? ), rule book (96 pages), Basic Role-Playing (16 pages), A sourcebook for the 1920's (32 pages), character sheets, world map, character & monster silhouettes. 2nd & 3rd editions have the same box cover art as 1st edition, and the box is 1"-deep, common to all but the earliest Chaosium releases. 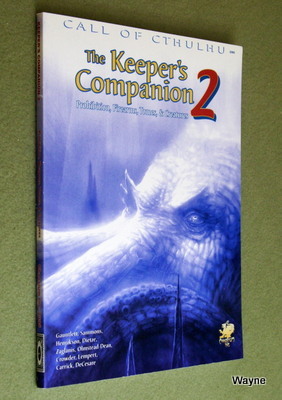 2nd Edition has the same product code as 3rd, but contents more like the 1st edition, though Basic Role Playing has been incorporated into the main rulebook. It has no ISBN. 3rd edition box still has 1983 copyright dates, but the Chaosium catalog inside has 1985 releases. 2nd Ed. Contents: 'What's in this box' contents sheet, rule book, 2nd ed (96 pages), A sourcebook for the 1920's (32 pages), world map, character & monster silhouettes. 3rd Ed. Contents: What's In This Box booklet; Investigator's Book; Keeper's Book; Sourcebook For The 1920s; World Map; Character Silhouettes. "Enter the awesome universe of the Cthulhu Mythos, those dread tales in which magic, science, arcane lore, and dark destinies irrevocably sear the lives of those for whom the bizarre and the curious have unseemly attraction. A universe where only a small band of brave men and women stand between the world as we know it and the unutterable evil of the Old-Ones whose minions plot the return and rule of their mighty lord, Cthulhu. As a player, your characters are the investigators, the guardians of life and sanity; as the Keeper (Gamesmaster), you'll evoke an atmosphere of the fabulous 1920's and reveal the cosmic horror underlying the events of the time. This complete role-playing game is ready to use and the fast-moving Call of Cthulhu rules provide fascinating fun in a world of-gothic horror in the true Lovecraft tradition. 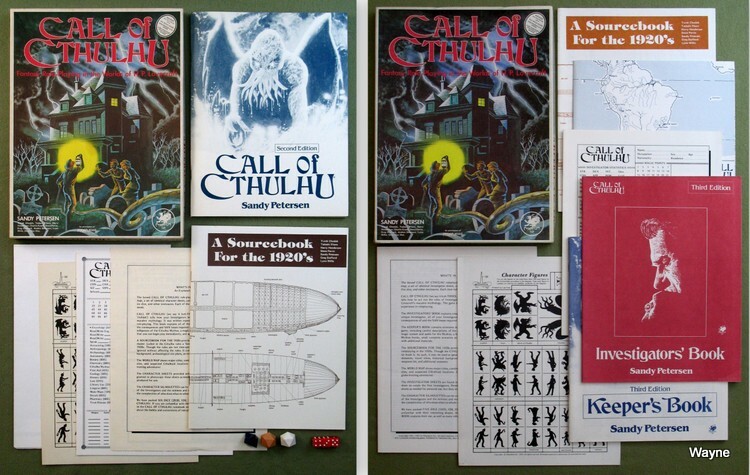 • CALL OF CTHULHU rulebook which details the characteristics, skills, occupations and resources for investigators; horrific beings specific to the mythos; full rules for magic; and more. • SOURCEBOOK FOR THE 1920's which gives non-mythos data - price lists, plans, maps, thumb-nail biographies, and a host of common-or-garden monsters on which investigators can sharpen their skills. • WORLD MAP showing 'dig' sites. • CHARACTER & MONSTER SILHOUETTES for use in play. • INVESTIGATOR SHEETS for detailing characters. • POLYHEDRAL DICE SET for use in play. "Enter the awesome universe of the Cthulhu Mythos, those dread tales in which magic, science, arcane lore and fetid horror irrevocably sear the lives of those for whom the bizarre and the curious have unseemly attraction. A universe where the veneer of normalcy is ever threatened by the plots and manifestations of the unutterably evil Old-Ones whose minions strive for the return and rule of their mighty and foul Lord, the Great Cthulhu. 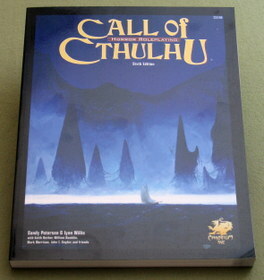 Cull of Cthulhu is a sophisticated, open-format game without conventional board or playing pieces, the action and events take place in the imaginations of the players and gamesmaster. As a player in Call of Cthulhu you are cast in the role of an Investigator piecing together clues and histories of the mythos as you move through the world of the fabulous 1920's. As a Gamesmaster (keeper) you will present this world to the players and control the cosmic horrors underlying the events of the time. This volume contains all the information needed, to play Call of Cthulhu and provide for many hours of fascinating involvement in a world of gothic horror in the true Lovecraft tradition." Contents: Foreword, Introduction,The Game Rules, Investigator Creation, Game System, Sanity, Cthulhu Mythos, Magic & Spells, Playing the Game, Color Portfolio, Scenarios (The Haunted House, The Madman, The Brockford House, Paper Chase, The Underground Menace, The Rescue, Mystery of Loch Feinn), 1920s Sourcebook, Beasts, Monsters, Time, Prices & Cash, Travel, Crime, Weapons, Prisons, Biographies, On Cultists, Researches, Automobile Chases, Spells: A Grimoire, Ritual Curses, Excerpts, Plan: Rail Coaches, Poetry (& Song), Cthulhu Cartoons, Sanity Quiz, Map: Arkham, Investigator Sheet, Map: Mass., R.I., Size Table, Size Foldout. "Horror Roleplaying in the Worlds of H. P. Lovecraft. Read the Edge-Marked Pages and Begin to Play. Dead Cthulhu Waits Dreaming... The Great Old Ones ruled the earth eons before the age of humankind. Remains of their cyclopean cities can still be found on remote islands of the Pacific, buried amid the shifting sands of vast deserts, and in the frigid recesses of the polar extremes. Originally they came to the world from out of the sky. Now they sleep – some deep within our enveloping earth and others beneath the eternal sea, in the drowned city of R’lyeh, preserved from the waters by the spells of mighty Cthulhu. When the stars are right they will rise, and once again walk the earth. Call of Cthulhu is a roleplaying game based on the works of H. P. Lovecraft, in which ordinary people are confronted by the terrifying beings and forces of the Cthulhu Mythos. Players portray investigators of things unknown and unspeakable. Except for dice, everything needed for play is included in this book. 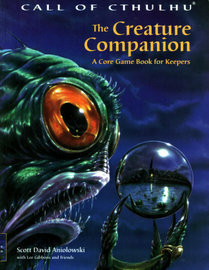 Expanded Lovecraft Background, On-Stop Investigator Creation (see page 16), New Illustrations, A Dozen New Skills, Three Eras of Play: 1890s, 1920s and 1990s, Improved Investigator Skills Increases, Over 200 Mythos Creatures and Spells, Ready-To-Play Investigators, Expanded Weapons Data From All Three Eras, New and Revised Scenarios, Expanded Mythos and Occult Tomes, Many Keeper Aids." "The Great Old Ones ruled the earth aeons before the rise of man. Remains of their cyclopean cities can still be found on remote islands in the Pacific, buried amid the shifting sands of vast deserts, and in the frozen wastes of the polar extremes. Originally they came to this world from the stars. Now they sleep — some deep within the earth and others beneath the sea. When The Stars Are Right they will rise, and once again walk the earth. Call of Cthulhu is a roleplaying game based on the works of H.P. Lovecraft, in which ordinary people are confronted by the terrifying forces of the Cthulhu Mythos. To play all you need are this book, some dice, and your friends." "The Great Old Ones ruled the Earth aeons before the incidental rise of humankind. They came from the gulfs of space, waged war upon one another, and then were cast own by even greater beings. Remains of their cyclopean cities and forbidden knowledge can still be found in the remote extremes of our planet. Upon uncharted islands, within dark ocean depths, under burning desert sands, locked within polar ice, miles below the Earth’s crust they lay imprisoned. But when the stars are right they will awaken and walk this Earth once more. "Call of Cthulhu is our classic roleplaying game of Lovecraftian horror in which ordinary people are confronted by the terrifying and alien forces of the Cthulhu Mythos. A bestseller with over 300,000 copies sold world-wide. Call of Cthulhu has won dozens of game awards. 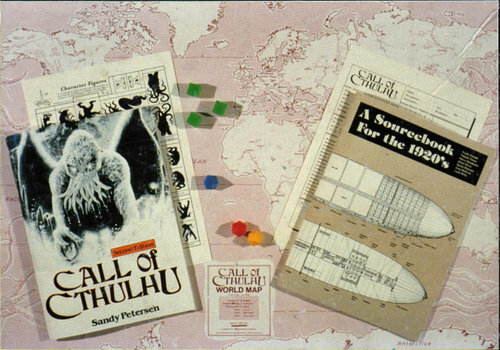 In 1996 Call of Cthulhu was elected to the Academy of Adventure Game Designer's Hall of Fame. Call of Cthulhu is well supported by an ever growing line of high quality game supplements. No Gaming library is complete without a copy of this book! 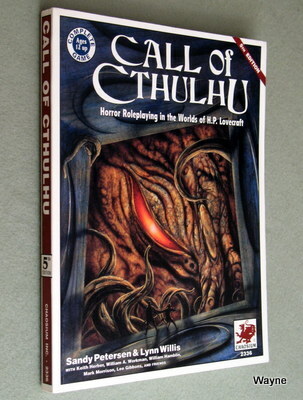 This new hardback edition is completely compatible with all our previous 5th edition supplements for Call of Cthulhu. Some sections of the book have been revised and clarified, and the book includes some new interior art. This book is a complete roleplaying game in one volume. All you need to Play Call of Cthulhu is this book, some dice, imagination, and your friends"
Sections: The Cthulhu Mythos in the Mesoamerican Religion (Tierney), Further Notes on the Neconomicon (Hamblin), Sourcebook Additions (Willis, Herber, Petersen), Rulesbook Additions (Rahman, Petersen, Crandall), Excerpts and Prayers (Lovecraft, Campbell, Long, Smith), Paper Chase (Sullivan), The Mystery of Loch Feinn (Rahman), The Rescue (Willis), The Secret of Castronegro (Pettigrew & Petersen). Poetry (Lovecraft), Sanity Quiz (Conrad). 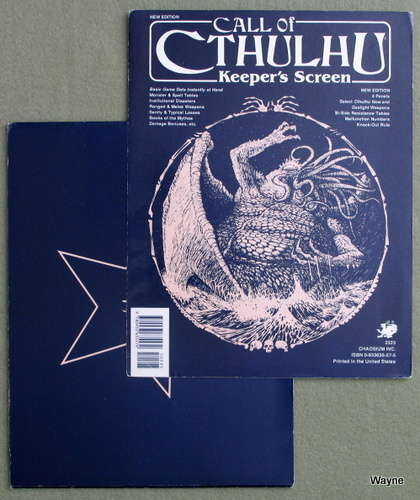 3-panel screen for 1st through 3rd editions of Call of Cthulhu. 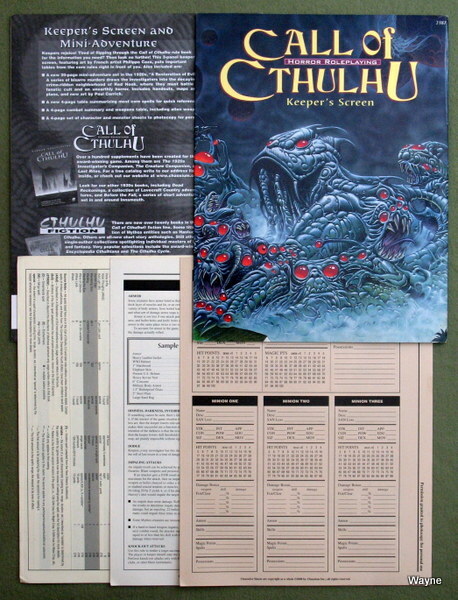 Includes a huge fold-out spread (4 connected pages) of Cthulhu monster size comparisons. 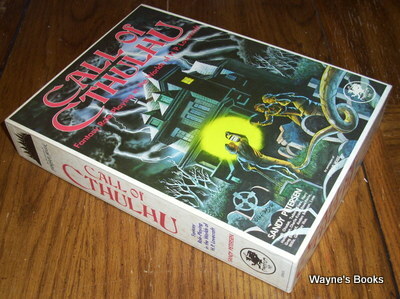 [ ] CALL OF CTHULHU QUESTIONS ANSWERED - Why does it take so long to read a Mythos tome? Why can't my investigator get 'used to' seeing common types of monsters? How do I learn a language in Call of Cthulhu? Must my character lose multiple Sanity for seeing multiple monsters? [ ] THE UBIQUITY OF CTHULHU - Working from the notes of brave Dr. Phileus P. Sadowsky (deceased), William Hamblin assembles ancient linguistic traces of the dread Cthulhu cult. [ ] A CTHULHU GRIMOIRE - Working summaries of all the spells from supplements Shadows of Yog-Sothoth, The Asylum, Cthulhu Companion, The Fungi from Yuggoth, Curse of the Chthonians, Trail of Tsathogghua, Masks of Nyarlathotep, and Fragments of Fear. Indispensible to keepers; deservedly horrifying to peeping players. [ ] SCENARIO - THE UNDERGROUND MENACE - Earthquakes hammer a hamlet in northern Michigan, but the townsfolk refuse to talk about the matter. 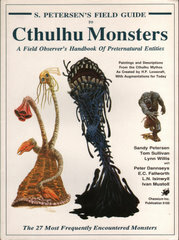 [ ] 4-PAGE CENTERFOLD - Size-comparison silhouettes of selected Mythos deities, entities, monsters, species. See how big Great Cthulhu really is! [ ] NEW DEITIES — Several new gods (and their servants) from the Mythos writings of Arkham House author J. Ramsey Campbell. [ ] SCENARIO - THE HIDDEN VALLEY - a dangerous quest leads the intrepid investigators into the 'heart of darkness' of the Belgian Congo jungles. This adventure may take several sessions to complete. [ ] MORE — Model Ritual Curses, Innsmouth Street Map, a poem by H.P. Lovecraft, Mundane Animals from several continents, Sandy Petersen's introduction. 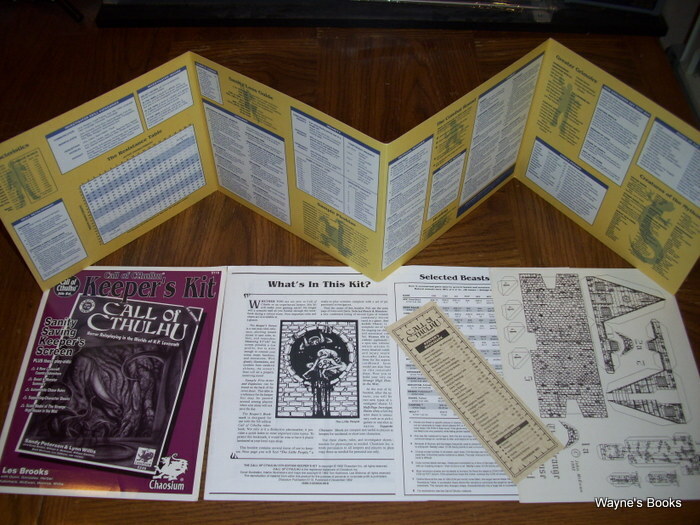 "Basic Game Data Instantly at Hand: * Monster & Spell Tables * Institutional Disasters * Ranged & Melee Weapons * Sanity & Typical Losses * Books of the Mythos ~~ NEW EDITION: 4 Panels * Select Cthulhu Now and Gaslight Weapons * Bi-Side Resistance Tables * Malfunction Numbers * Knock-Out Rule"
"Things Players Were Not Meant to Know. Drawing from the tales of H.P. 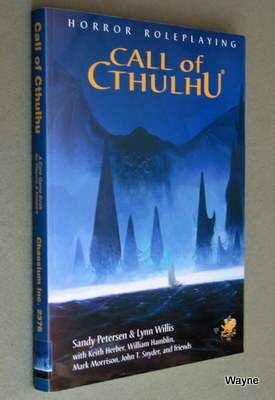 Lovecraft and many other authors, the information contained in this book supplements and expands upon that given in the CALL OF CTHULHU rulesbook, and is divided into four main sections. 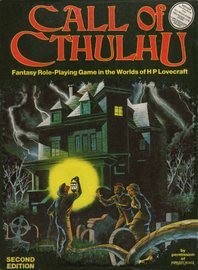 FORBIDDEN BOOKS: expands upon the most famous Mythos tomes listed in CALL OF CTHULHU providing lists of suggested spells, study times, descriptions, and the benefits acquired from studying the books. Some of the two dozen books covered include: The Necronomicon, The Book of Dyzan, Cultes des Goules, Massa di Requiem Per Shuggay, The Revelations of Glaaki, and The R'lyeh Text. SECRET CULTS: stereotypically, the cultist is a cackling madman dressed in hooded robe and armed with a wickedly curved knife. In fact, cultists are of wide description; cults are essentially religious organizations holding certain beliefs and attempting to induce some sort of change. Described here are differing cults drawn from fiction, game scenarios, and history: The Starry Wisdom Sect, Brotherhood of the Beast, The Nestarian Cult of Cthugha, Brothers of the Yellow Sign, The Hermetic Order of the Golden Dawn, Witch Cults, Order of the Sword of St. Jerome, and the Cult of Cthulhu. ALIEN RACES: this section defines the aims, values, and goals for various frequently-encountered races including Deep Ones, Fungi From Yuggoth, Ghouls, Insects From Shagghai, Old Ones, Serpent People, and the Voormis. MYSTERIOUS PLACES: shrouded in legend and obscured by misinformation and disinformation, the following forgotten and exotic places are all referred to in Mythos tomes: Atlantis, G'harne, Hyperborea, Irem, Kaddath in the Cold Waste, K'n-Yan, Lemuria, Lomar, Mu, The Nameless City, R'lyeh, Valusia, Y'ha-Nthlei, and Yuggoth and beyond." • A new 20-page mini-adventure set in the 1920s, "A Restoration of Evil." A series of bizarre murders draws the investigators into the decaying, crime-ridden neighborhood of Red Hook, where they must battle a fanatic cult and an unearthly horror. Includes handouts, maps and plans, and new art by Paul Carrick. • A 4-page combat summary and weapons table, including alien weapon listings. • A 4-page set of character and monster sheets to photocopy for personal use." 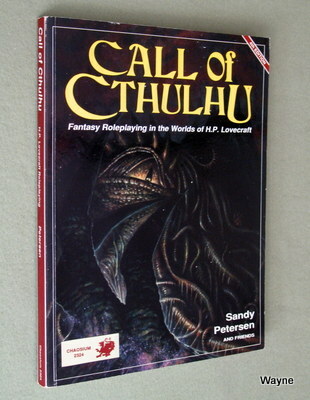 "This volume contains dozens of new races and individual creatures for use with the Call of Cthulhu roleplaying game. 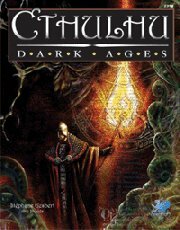 Included here are the following categories: Outer Gods, Elder Gods, Great Old Ones, Great Ones, Avatars, Servitor Races, Independent Races, Fabulous Creatures, and Unique Entities. These monstrous creations have been collected from fiction spanning over seventy years and from over ten years of favorite Call of Cthulhu scenarios. The darkly imaginative work of a diverse group of authors is represented here. Where possible each entry begins with a quote describing the monster or entity. Where much about the creature is known, there may be an additional description. If discussing a god, Great One, or Great Old One, notice of any human cult comes next. Further notes discuss habit, habitat, or attack. An essential aid for players, investigators, and keepers." 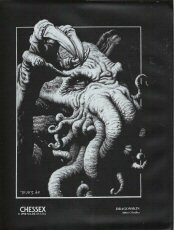 "This volume contains dozens of new races and individual creatures for use with the Call of Cthulhu roleplaying game. Included here are the following categories: Outer Gods, Eider Gods, Great Old Ones, Great Ones, Avatars, Servitor Races, Independent Races, Fabulous Creatures, and Unique Entities. 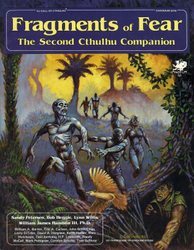 These monstrous creations have been collected from over ten years of favorite Call of Cthulhu scenarios; others have been created specifically for this book. The darkly imaginative work of a diverse group of authors is represented here. Where possible each entry begins with a quote describing the monster or entity. Where much about the creature is known, there may be an additional description. If discussing a god, Great One, or Great Old One, notice of any human cult comes next. Further notes discuss habit, habitat, or attack. 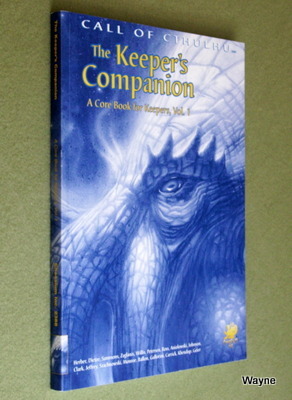 An essential aid for players, investigators, and keepers." "We are not alone. The universe teams with life. We name them Outer Gods, Elder Gods, Great Old Ones, Avatars, Servitor Races, Independent Races, and they are all either malevolent or uncaring. 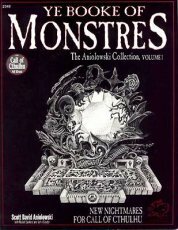 This monstrous collection is a compendium of creatures, drawn together from fiction spanning over seventy years and from over ten years of Call of Cthulhu scenarios. Learn the secrets of the monsters of the mythos. 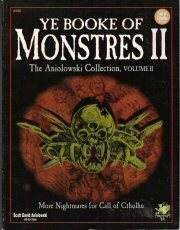 Parts of this book were originally published as Ye Book of Monstres I and II." 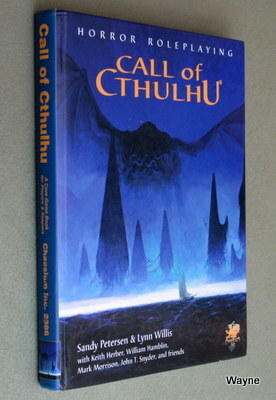 "New to Call of Cthulhu? A battle-scarred veteran of many campaigns? 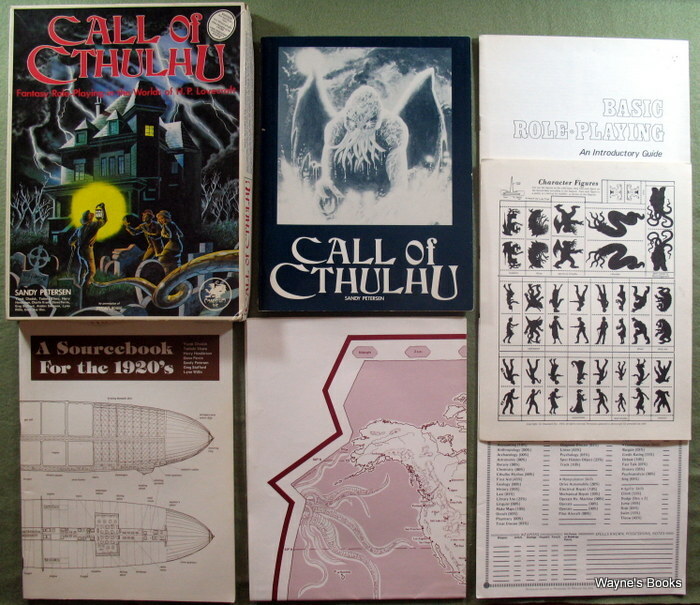 Here is essential guidance and background to help you host Call of Cthulhu games more easily and skillfully. • 13 Suggestions for Keepers - Common sense and sly applications to improve your games. • Occult Books - More than 60 occult books and references summarized, often including titles of individual chapters. • Languages and Scripts - A quick guide to when languages and language forms existed. • Arcane Antiquities - More than 20 items and artifacts not gathered by the rule book, taken from stories and scenarios. Background, pertinent stats, mechanics. • Secret Cults - Antagonists, allies, and scholars who know too much for safety or sanity. • Forensic Medicine - the science and techniques of death investigation, past and present, in cogent detail. • Alien Races, Mysterious Places - Two short chapters concerning special mysteries of the Mythos, from deep ones and voormis to Atlantis, Yuggoth, and beyond. • Skills, Expansions, New Skills - fresh discussion of skill applications, coverages, and how some skills relate. More than 80 skills. • Plus Good Cthulhu Hunting, An Alternate Resistance Table, Feverish Study, Law Enforcement Timeline, Circumstances of Death by State, Brainstorming, Books and Sanity: Alternate Rules, updated Investigator's Sheet, etc. 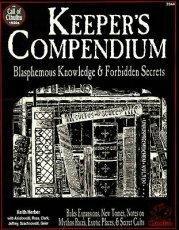 The chapters "Forbidden Books", "Secret Cults", "Alien Races", and "Mysterious Places" originally made up the Keeper's Compendium and appear here in corrected or revised form." "The History Behind Prohibition" - A lengthy article bringing anti-alcohol advocates, law enforcement, gangsters, rum-runners, and consumers into focus. Lots of good stories. 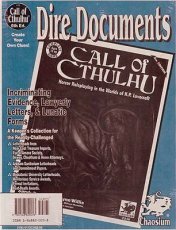 "The Keeper's Master List of Call of Cthulhu Scenarios" - Lists are alphabetical by the following topics: scenario era; creature / maniacs / great old ones; legendary heroes and villains; cults / sects / secret societies; Mythos tomes; fictitious locations; and Mythos books from publishers other than Chaosium. And More: - "Mythos ex Machina" gathers about forty examples of alien technology from Cthulhu supplements. Gordon Olmstead-Dean outlines the odd connections between H. P. Lovecraft and the Satanists HPL never knew, in "LaVey, Satanism, and the Big Squid". Indexed." "950 A.D.— The Byzantine Theodorus Philetas translates the al-Azif into Greek and renames it the Necronomicon. It will be more than a century before this blasphemous tome is finally condemned, and most copies destroyed. CTHULHU DARK AGES presents the era of the Dark Ages (c. 1000 A.D.) and the continuing threat posed by denizens of the Cthulhu Mythos as described by H. P. Lovecraft, the Lovecraft circle of writers, and the works of Chaosium Inc."
"INCLUDED: 99 multi-color cards, 50 1" square monster counters, 56 H.P. Lovecraft bank notes, 2 Arkham Gazettes, 1 rules folder, 2 About Your Investigator folders, 1 17x22" full-color mapboard showing Arkham and the 8 Other Worlds, 8 investigator cards, 8 investigator pawns, 2 dice, investigator card markers, inserts. ARKHAM HORROR IS PLAYABLE by up to 8 people. As fearless investigators, the players seek to uncover the strange events and stranger beings behind the placid facade of this New England town. Duty and fortune may separate the investigators. Injury, mental shock, or magic can affect or remove them from the game. The arcane powers of the Cthulhu Mythos, a sinister amalgam of alien beings and human cultists, have come to Earth by means of magical gates. If the investigators destroy these gates before the space-time continuum is irrevocably strained, then the players win. If too many gates open, the players lose, and Arkham is overrun. Exploring its streets, buildings, woods, and parks, the investigators meet helpful and hindering people, find magic-laden books, and discover, trade for, or purchase helpful items. No player loses unless all the players lose, nor is any player eliminated from the game before it ends: losing one investigator, another is chosen, and play renewed." "Pummel the President. Buy a Tank. Sack Arkham. Sink R'lyeh. Shoot Nyarlathotep with a Cosmic Ray Gun. Rule the Free World. In Cults Across America, you'll do all that and more. You'll take charge of an insanity-inducing faction of frothing fanatics. You'll command cultists, high priests, tanks, nuclear reactors, the national guard, the Pope, the President, and maybe even Cthulhu himself. You can start the plague, assert yourself with whips and chains, race in the Mythos 500 aboard a satanic pushcart, and invade the Dreamlands. What could be more fun than sacking Waco aboard a Big Honkin' Truck with Ghatanothoa at your back and the Necronomicon in your hand? Cults Across America is a high-powered board game featuring challenging resource management, detailed combat choices, three scenarios that let you play the game you want to play, a host of cards that can change the game's course in seconds, and a severe attitude like nothing you've ever seen in a board game." "It's an inbred, corpse-fed, blood-red bonanza! Old Wizard Whateley kicked the bucket! And his precious copy of the Necronomicon, a book of powerful magic, is up for grabs. Now four factions of monstrous, power-hungry hillbillies must ransack the ramshackle shacks of Dunwich in a frantic search for the treasure. Pit your team of drooling horrors against your friends in an all-out battle of bullets, brawn, and brains. (Yum, brains!) 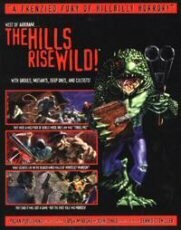 The Hills Rise Wild! is a fast-play miniatures game that's light on the rules and heavy on the ghouls." In his stories, Lovecraft imagined a handful of scholars and investigators burdened with knowledge of other dimensions and perilous entities, which the rest of the world could not comprehend. Bizarre evidence, ancient writing, and obscure coincidence gave weight to the threat of catastrophe. Only those few recognized the doom that threatened the world. 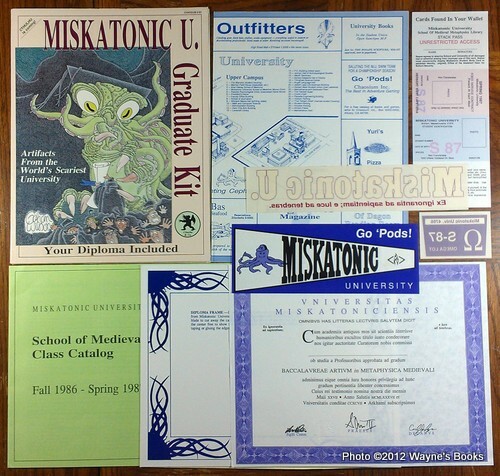 Since Lovecraft wrote, Miskatonic U. has survived, thrived, and grown famous. Tales are still written about it; films are set there. You can enroll today. Enrollment takes only a few seconds, and you can graduate as soon as you put your name on the enclosed diploma. Join the community. * Course Catalog from Miskatonic's School of Medieval Metaphysics, explaining enrollment and graduation procedures and individually describing more than 160 classes within the School. * Presentation Diploma awarding you in Latin a Bachelor of Arts degree in Medieval Metaphysics from Miskatonic University. School colors on nice paper. Type in your name, and frame the nifty results. * Student Body Card with space for your picture as well as your name and other information. * Restricted Stacks library pass. Parking Sticker for Omega lot, preserve of the School of Medieval Metaphysics. * School Map place mat souvenir shows Lower and Upper Campuses. * Notepaper from Pickman Hall, handy for short messages or complex formulae. * a "Hi, my name is..." badge for the School's annual Conventicle, a cafeteria card for Herbert West Memorial Cafeteria, a back window sticker for Miskatonic University (with school motto), an alumni association card, etc." "Weird shapes in the park? Odd rumbling noises in the basement? When you need to know what you're encountering, you need to know it fast - don't leave home without the Field Guide! Paintings and Descriptions From the Cthulhu Mythos As Created by H.P. Lovecraft, With Augmentations for Today. "Accurate and Complete. Over Two Dozen Often-Met Creatures. Quick-Reference Monster ID Key. 27 Evocative Full-Page Paintings. 50+ Illustrations and Silhouettes. Uniform Presentation of Data. Special Size Comparison Charts. Habitat, Distribution, and Life Cycle Notes. How to Distinguish Similar-Seeming Entities. Latest Hyper-Geometric Scholarship. Specialized Observer Warnings as Needed. Full Bibliography. Faithful to Lovecraft. Selected Pronunciations: Azathoth: AZ-uh-thoth, Byakhee: B'YAHK-hee, Cthonian: kuh-THOEN-ee-un, Cthulhu: kuh-THOO-loo, Dhole: DOEL, Ithaqua: ITH-uh-kwah, Nyarlathotep: NIE-ar-LATH-oe-tep, Shantak: SHAN-tak, Shoggoth: SHOW-goth, Shub-Niggurath: SHUB-NIG-ger-ath, Tindalos: TIN-dahl-ose, Yog-Sothoth: YAHG-SOE-thoth." "Necronomicon; Cultes des Goules; De Vermiis Mysteriis. * Beware of stranger who eye your reproductions!" "This packet contains essential play-aids for all Call of Cthulhu players and keepers. 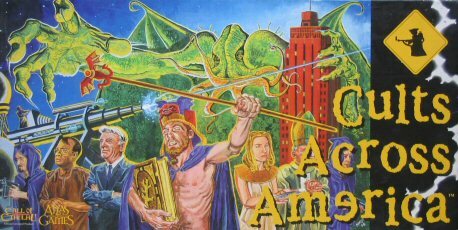 • A specially-constructed 8.5x33" colorful four-panel Keeper's Screen featuring an additional 8.5x11" panel — instant access to important tables and rules from the Cthulhu game while minimizing play interference. • A brand-new adventure, "The Dead-Man Stomp" was specially written for this package, and is suitable for both beginning and experienced players. • Eight copies of the new, updated 1920s Character Sheet provide a convenient place for your players to summarize game data and are ready-to-use. 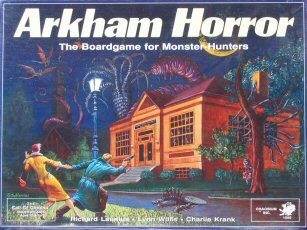 • The Monster Master, five copies of a new form on which the keeper can organize game data for his crazed cultists, maniac madmen, wicked wizards, and degenerate denizens of the Cthulhu Mythos. • Each packet contains one of two different stickers, either a back-window university sticker for your car, or a "Go Pods!" bumper sticker proclaiming your loyalty to old M.U. • A handy Miskatonic U. Note Pad, in a new style, provides a convenient spot for the keeper to jot sinister ideas, devious plots, and terrifying notes. 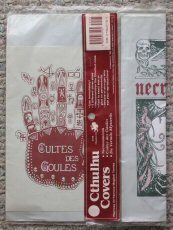 • A special Mythos Bookcover in one of three styles, either The Necronomicon, Cultes des Goules, or De Vermiis Mysteriis, can be used to protect your favorite haunting tome. Rune R. spotted (10/31/2013) an eBay auction of this Fifth edition Keeper's Kit with the addition of some black/white/red character sheets not mentioned in the contents. The CS are copyright 1993 (kit is ©1992) so I'm thinking that a later printing of this Kit had some CS added. To be verified. "This kit contains the ALL NEW 8.5" x 40" colorful four panel Keeper’s Screen featuring an additional 8.5x11" panel of firearms and explosives — completely redesigned for instant access to important spot-rules, tables, and reminders from the Call of Cthulhu game. * A new "Lovecraft Country' Adventure, ”The Little People" set in fabled Arkham, Massachusetts, was specially written for this package, and is suitable for both beginning and experienced players. * A Keeper’s Bookmark with a quick index to most important rules topics. Designed specifically for use with the 5th edition Call of Cthulhu rulesbook. * A set of useful rules and tables including: Selected Beasts & Monsters, a new condensed listing of several types of creatures commonly encountered in a game. Automobile Chase rules are provided for staging classic car chase scenes with associated combat. Human Hit Locations is a reference which allows more detailed combat and injury results. incidental or short term investigators. * A scale model of 'The Strange High House in the Mist, sturdy cardboard model kit with assembly instructions included." "Incriminating Evidence, Lawyerly Letters, & Lunatic Forms." 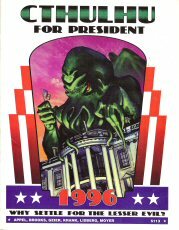 Cthulhu for President 1996: Why Settle for the Lesser Evil? "Why Vote for the Lesser Evil? It's 1996, and the horrors of the Presidential Campaign are once more upon us. Now you can show your support for the only truly experienced candidate. This Cthulhu for President kit includes: a red, white and blue Cthulhu in '96 button; a postcard of Cthulhu at the White House; a red, white, and blue Cthulhu in '96 yard sign; a full color 11"x17" poster; a red, white, and blue Elder Party window sign; an 8-page book of speeches, posters, and other 1996 memorabilia; a red, white, and blue Cthulhu for President bumper sticker; and a copy of Cthulhu's controversial new vision booklet, "Contract on the Earth." Don't Settle for Less! Vote the Elder Party! No More Years!" "CTHULHU LIVE is set in the universe of eldritch horror created by Howard Phillips Lovecraft. CTHULHU LIVE is a theater-gaming experience of horror, action, and suspense. The participants are both actors and audience. The game is a full evening's worth of fun every time it is played. The host [keeper] controls the flow of action, much as a theatrical director directs a play. Props, costumes, special effects, and interesting locations contribute to a rich dramatic environment. Some players act out the parts of background characters, guided by the keeper. Other participants play investigators, tracking down clues and deducing their next moves. The investigators work together to solve puzzles and overcome obstacles standing between them and their final goal, perhaps rescuing a friend or saving the entire world. AH participants react spontaneously — there is no dialogue to memorize. New features to CTHULHU LIVE SECOND EDITION are: A greatly revised combat system, more character templates, new monsters, new skills, a convenient rules-booklet size, and two new adventures. With CTHULHU LIVE SECOND EDITION you can play any kind of horror game, or enact any plot involving mystery and investigation. A typical game needs no more than eight to ten people." "Prepare to take your CTHULHU LIVE events and campaigns to the next level! The third supplment for CTHULHU LIVE SECOND EDITION, the PLAYERS COMPANION gives keepers and players alike everything that they need to expand and enrich their live-action horror role-playing games. From prop-buildind and costuming to new rules for character creation and live-action combat, the PLAYER'S COMPANION will help you transform your CTHLUHU LIVE games into exciting and memorable special events. - Detailed guidelines for organizing and running ongoing CTHULHU LIVE campaigns"
"The first supplement for CTHULHU LIVE SECOND EDITION, SHADES OF GRAY explores the horrors of the Cthulhu mythos from the perspective of the pulp and noir genres. As two-fisted pulp avengers, deadly femme fatales, and cynical gumshoe detectives, the players match their wits against the forces of darkness. From the steaming jungles of the 1920s to the mean streets of the 1950s, SHADES OF GRAY gives you everything you need to run live-action horror adventures in the worlds of pulp fiction and film noir; genre conventions, character types and interaction with the horrors of H.P. Lovecraft's Cthulhu mythos. In conjunction with the pulp and noir genres, SHADES OF GRAY also introduces elements of Pagan Publishing's acclaimed DELTA GREEN campaign for use in your CTHULHU LIVE game. 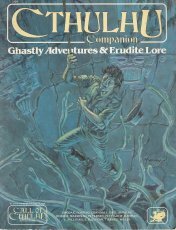 A supplement for the CTHULHU LIVE live-action role-playing game, SHADES OF GRAY introduces new skills, new character templates, new combat rules, background material for the pulp and noir genres, rules for playing servants of the Great Old Ones, and five complete game scripts." "The second supplement for CTHULHU LIVE: 2nd EDITION plunges Keepers and and players into the darkest corners of the Cthulhu Mythos. From the incarnate madness of the Church of the Yellow Sign, to the killers of Mund-Caprice family. LOST SOULS give you everything that you need to run a live-action horror campaign exploring the black rituals and foul agendas of the Mythos. - Descriptions of dozens of Mythos Cults"
"Bursting into the front bedroom, Special Agent Harbin found the senator and his wife tightly bound and lying on the floor. The glare of a flashlight exploded in his eyes and a bullet cracked past his ear. Diving across the room, Harbin rolled to bring his weapon to bear. A second shot lightly grazed his left arm. Isom rushed in and both agents finished ojf the gunman in a spray of 9mm rounds. Working quickly, Harbin stripped the tape from the senator's mouth. "You're safe now, sir! We'll haveyou and your wife out of here in minutes!" The senator's face wax a contorted mask of terror in the green light of the night-vision goggles. "No! We're all going to die! The others! The others come after nightfall! Out of the woods! Her favored children! The Black Mother!" 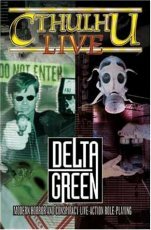 The fourth supplement for CTHULHU LIVE SECOND EDITION, DELTA GREEN is based on the Origins Award-winning sourcebook of conspiracy and modern Mythos horror. Players assume the roles of agents and "friendlies" of Delta Green, a conspiracy whose tendrils have spread through all levels of the US government. Born of the raid on the small Massachusetts seaside town of Innsmouth, the shadowy organization has been seeking out and confronting the forces of the Mythos for more than 70 years. 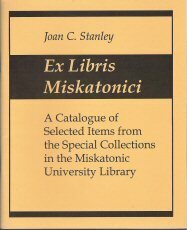 • Organizational and operational details on major groups, from Delta Green to Majestic-12"
"It is well known that the Miskatonic University Library holds in its collection some of the rarest and most obscure volumes in occult literature. Until this time, access to materials within the library have been restricted to scholars and researchers, and only those with significant academic credentials. Now, in this greatly detailed and researched volume, university librarian Joan C. Stanley offers some background on the various collections to be found within the library, as well as detailed descriptions of many of the more infamous volumes contained therein. To be found in this book are chapters detailing histories of the library's copies of The Pnakotic Manuscripts, The Eltdown Shards, The Celaeno, G'harne and Sussex Fragments, The Seven Cryptical Books of Hsan, The Book of Dzyan, The R'lyeh Text, The Dhol Chants, The Ponape Scripture, Codex Dagonensis, Les Cultes des Goules, De Vermis Mysteriis, Peri ton Eibon or Liber Ivonis, Die Unaussprechlichen Kulten, as well as the most notorious volume in the university's collection, The Necronomicon. This publication also includes information on The Voynich Manuscript and Praesidia Finium or Frontier Garrison, as well as a bibliography and introduction detailing the university library's history, and how it came to obtain these volumes through the years." Vinyl bookcover meant to fit 8.5x11" books. 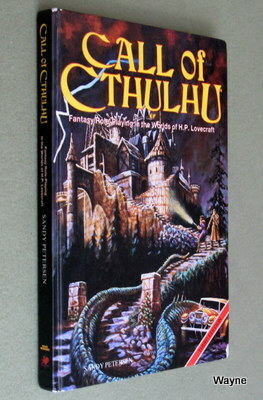 Cthulhu horror cover art by Miles Teves of Jorune fame. "The Cthulhu Mythos was first created by H.P. Lovecraft (1890-1937), a Providence author considered by many to be the finest horror story writer of the twentieth century. Lovecraft's tales are a blend of fantasy, science fiction, and horror, with the latter being especially prominent. His tales describe a pantheon of powerful beings known as the Great Old Ones. Since Lovecraft's time the Cthulhu Mythos has grown exponentially, until it has become increasingly difficult to keep track of, even for devoted fans. Many writers have contributed to it, including Robert E. Howard, Robert Bloch, Brian Lumley, and Stephen King. This book is the first major attempt in many years to provide a comprehensive guide to H.P. Lovecraft's Cthulhu Mythos." 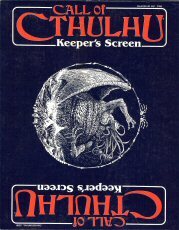 Chaosium owns (and holds trademark to) Call of Cthulhu roleplaying in all forms.